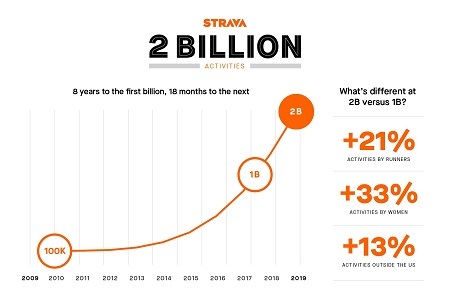 Strava athletes shared more than one billion activities in the last 18 months, surpassing two billion total uploads. This rapid growth is credited to the impact of three groups on the platform: women, runners, and international athletes. Since crossing the one billion activity threshold, Strava has seen 33 per cent growth in activities uploaded by women, 21 per cent growth in run activity uploads, and 13 per cent growth in uploads outside of the United States.